My daughter Lori's birthday is today, but we are celebrating it Saturday. I made a card for her a couple of weeks ago, but I think I need to make her another to match this frame. The card I made is pink and this is peach, so they don't look very good together. Somewhere, between now ad Saturday I will hopefully get a card made to match. I bought this wooden frame for $1.00 at Michael's (thanks for the tip Selma). 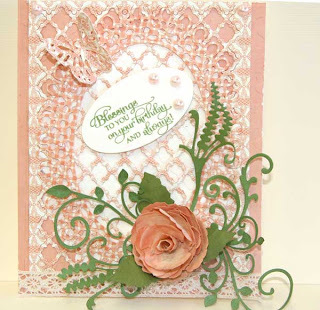 I covered it with this gorgeous paper from the 8x8 Graphic 45 Secret Garden Paper Pack. I covered the edge of the frame with Washi Tape that exactly matches the colors in the paper. Can you see 2 strips of it behind the flower in the middle also? After gluing down the paper with Glue and Seal and letting it dry, I use the Curl Frame #329 Template around the opening in the frame. I used the medium weight of Liquidtex, colored it with Tattered Rose Reinker. After carefully taping down the template, I applied the colored Liquidtex over the template. After all was covered I carefully removed it and let it dry. I love what it did for the paper and the change it gave to the look of the frame. If you double click on the frame, it will enlarge so you can see it better. Then I covered the inside of the frame with the Secret Garden matching peach paper. Using some of the paper from the same 6x6 paper pad, I cut out the #3 Build a flower, condition the paper and made the flower. 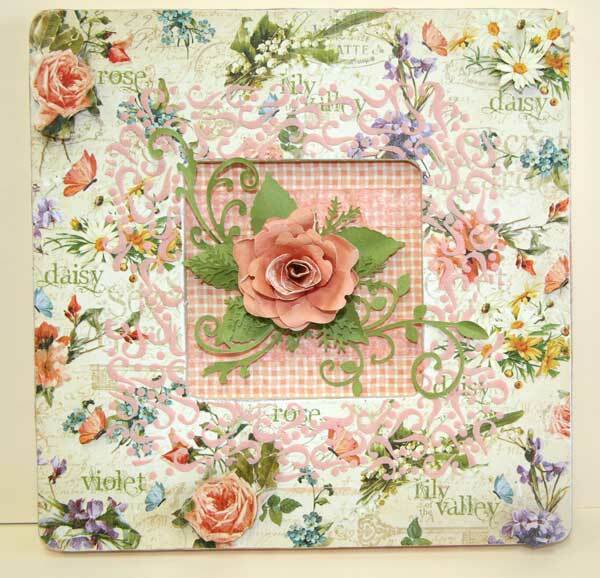 Adding some rose leaves, pine branches and mini Flourishes the inside of the frame was complete. I then used another piece of the paper and cut out some of the roses, daisies, violets and butterflies, put a piece of foam and popped everything up on top of the paper on the frame. It was a nice addition to the finish the look of the frame. If you double click on the frame, it will enlarge so you can see it better. 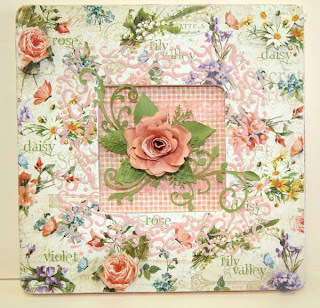 This is really beautiful Joan...and I have some of those frames, ...love the altered look with that gorgeous paper!! GORGEOUS Joan! Lori's going to LOVE it!! The paper is SO pretty and your flower matches the one on the paper perfectly! BEAUTIFULLY DONE!! I really need to make a trip to Indiana! I 'need' these new papers and heaven knows what else, lol! Soon I hope! How gorgeous! That's stunning paper, and the exquisite rose and leaves embelli is knock-me-over fantastic. I think the little fir-branch springs are wonderful under the flower! The special effect and treatment on the frame makes this perfect for hanging on a wall. What a GREAT idea you shared in this one. Thanks again, Joan! and Happy Birthday to your DD. Happy Birthday to your daughter. Lovely card.